My mother-in-law has the best recipe for honey garlic chicken. This is not the honey garlic chicken that is little bits and pieces and you serve over rice, this recipe uses full pieces of chicken, can be chicken thigh or chicken breast and cooks up in a skillet so fast and easy it will soon become you new favourite! Honey garlic chicken doesn’t get easier than this! Whisk together all of the sauce ingredients in a bowl large enough to hold the chicken as well. Reserve some of the sauce for later. Place chicken into the sauce and cover. Marinate. Pre-heat an oven safe skillet with olive oil in it. Fry the chicken until the skin started to crisp up. Pour the remaining sauce on top of the chicken. 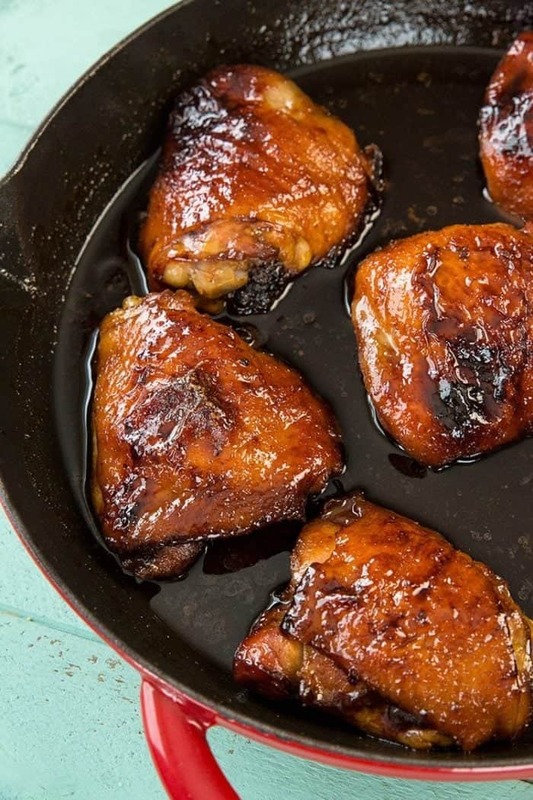 Place the skillet into the oven and bake until the thighs reach an internal temperature of 185 degrees F.
I was lazing around one Sunday and had a message pop up from a reader that asked me for a really good honey garlic chicken recipe. I scratched my head a bit and realized that I don’t actually make honey garlic chicken on a regular basis. Yes, I make my Uncle Bob’s Japanese Chicken Wings, but I don’t make honey garlic chicken. And presto, I was craving honey garlic chicken yesterday, just like that. I became a wee bit obsessed with the thought of honey garlic chicken for dinner and mentioned it to Mike as I was taking chicken thighs out of the freezer that someone had asked me if I knew a honey garlic chicken recipe and now I was CRAVING IT. He looked up from his laptop and excitedly said ” Oh man, my mom has the BEST honey garlic chicken recipe ever! Let me ask her for it!” Now listen, Mr Magpie doesn’t really get excited about food like that, so I was totally game. Don’t tell him this, but he was right. This is seriously the best honey garlic chicken recipe ever. 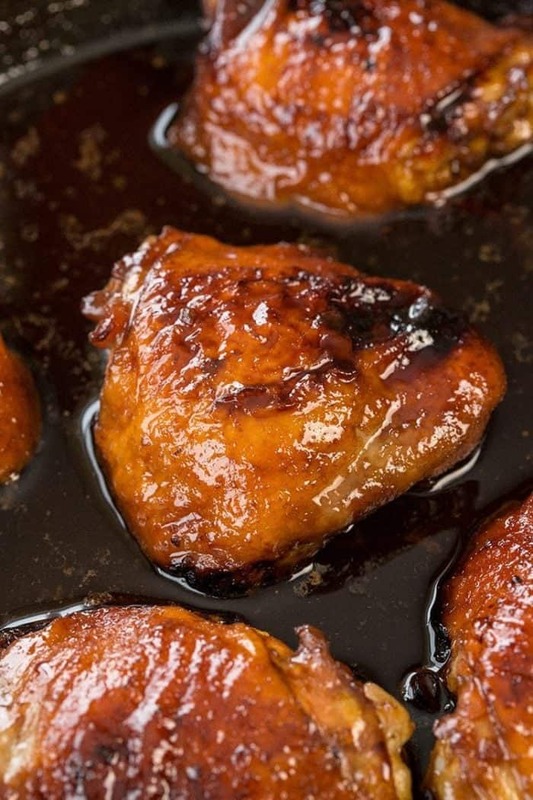 The reason that this is THE BEST honey garlic chicken recipe is the sauce, of course! Mike’s Mom puts in some easy and amazing ingredients but not necessarily authentic.The ketchup of course isn’t authentic but let me tell you, ALL other sauces pale in comparison to this recipe, trust me! 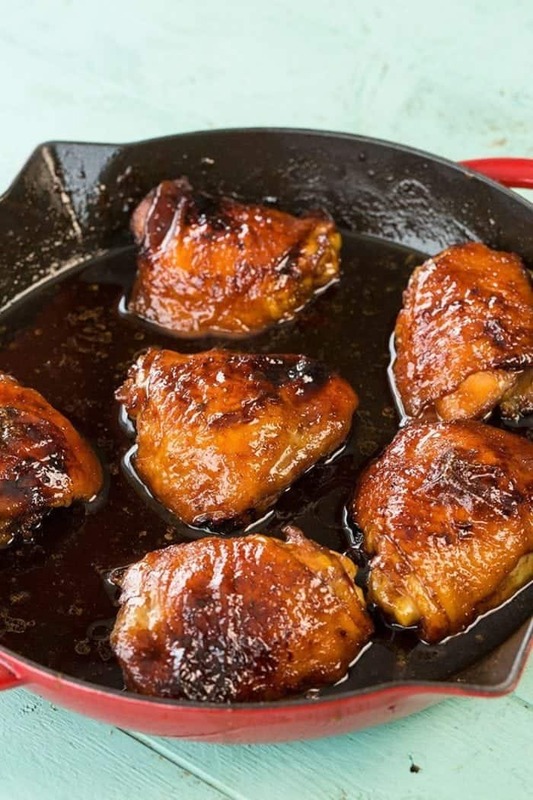 You can use chicken thighs or chicken breasts and I highly recommend using skin on for the best honey garlic chicken. The skin becomes crispy, sticky and utterly delicious when cooked! Cook the chicken thighs to 185 °F for the best texture. While you can cook it to 165 °F for safety sake, you actually want to cook thigh meat to a higher temperature to break down the meat better. It is tough meat at 165 ° and like butter when you reach 185 °F. This is a trick I learned from some chef friends and it will make you a chicken thigh addict! Cook the chicken breast to 165 °F and no more. The sauce is beyond amazing, make sure to reserve some sauce before you marinade the chicken, I like to use fresh sauce later on and not the marinade. This Sweet Honey Curry Chicken is a reader favourite- and a surprise hit with most people! This creamy chicken Florentine is so easy! My crispy oven baked chicken thighs are a copycat recipe of Shake and Bake! This honey garlic chicken is ooey and gooey and sweet and garlicky and I was sad that I only made 6 chicken thighs! Karlynn, you fool! What were you thinking? You can make as much sauce as you want with it – we reserved 1/2 cup to the side to add onto the chicken later after you crisp it in the pan – and just pour that all over rice after the chicken is cooked, it make a great sauce.. Not only that, this recipe is so easy – the sauce is only 5 ingredients! It’s crazy easy! Whisk together all of the sauce ingredients in a bowl large enough to hold the chicken as well. Reserve about a 1/2 cup of the sauce for later. Place chicken into the sauce and cover. Marinate for an hour or two if possible, turning if you get the chance. 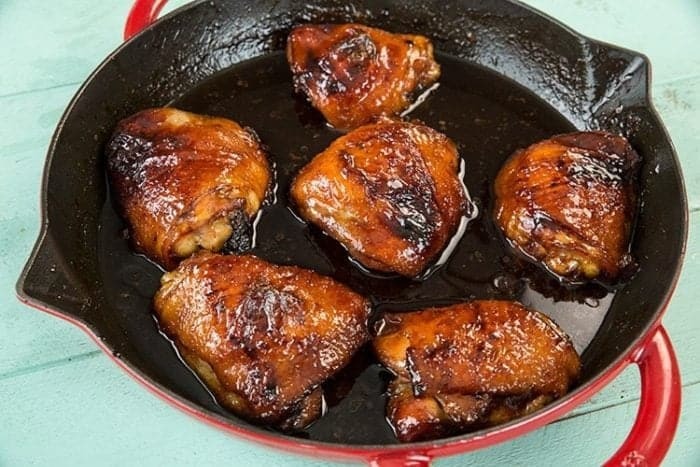 Place the skillet into the oven and bake until the thighs reach an internal temperature of 185 degrees F. You can occasionally baste the chicken with sauce while cooking if wanted. Serve with rice, potatoes etc. It's exceptional with rice! The nutrition on this is wrong and includes ALL of the sauce in the values, which you don't eat. The calories are way less. And another hit from Karlynn! Executed in our kitchen with a precise exactness of 5! ))) ingredients! Excellent recipe, easy to prep and cook! Sauce – out of this world! Big hello to Mother-in-law! It was a huge favorite at tonight’s dinner – served with white rice and tossed salad! Thanks for a wonderful recipe! Taras. Awesome! I am so glad to hear it! Thanks for letting me know! This sauce it terrific. I always trust your recipes. Thank you for sharing it with us. Awww I am so glad you liked it! Made this for my family tonight. Big hit! I used a dry measuring cup for the honey, but it’s really just to get it close. I wouldn’t worry too much about being exact with marinades. Made this for my family last night and they gobbled it up!! It’s definitrly a favourite for us! Just wondering, do you measure the honey with a liquid or dry measuring cup ? A great recipe – my husband could even cookthi wonderful, but easy. As he is my carer this would be a lovely meal. Thanking You!!! !